If you are passenger in a car that is involved in an accident and you have sustained an injury, you have the right to file a claim for injuries. Often, passengers in a car know the driver. the relationship could be friends, husband-wife, mother-son, father-daughter or many other types of relationships where you know the driver well. As skilled personal injury attorneys we understand, there is a stigma about filing a claim for serious injuries against someone you know. However, that is typically the only way you can get your medical bills paid and be fully compensated for your injuries. Don't forget, the claim is really being made against the driver's insurance company and being paid by them. The driver had insurance for this very day. There is nothing wrong, and it is perfectly legal and acceptable, to pursue a claim for injury, even if you know the driver. Our experienced Chicago injury lawyers at Nemeroff Law Offices have had years of success achieving large settlements and verdicts in the area of personal injury and car accidents. Contact an attorney at Nemeroff Law Offices for additional information about our car accident lawyers and personal injury attorneys. We offer a free consultation with a knowledgeable car accident lawyer from our firm. Weekend and evening appointments are available. If your injuries prevent you from traveling, we can come to your home or hospital. Never accept an insurance settlement without talking to an experienced Chicago car accident lawyer first. In most cases, passengers of auto accidents are without fault and entitled to recover. If this is the case, the driver's insurance company may act quickly to offer you a settlement. Many accident victims will be tempted to take the settlement and avoid contacting an attorney. If you accept the settlement, you will be forfeiting your right to seek future compensation. Many accidents victims don't do realize that their injuries can be more serious than they appear, requiring additional treatment or surgery. It is our experience that most serious injury cases end up having a lawsuit filed. That is typically the only way to force the insurance company to be fair and fully compensation the accident victim who is seriously injured or the family of someone who has died while a passenger in an accident. Take the time to meet with an experienced Chicago car accident attorney for a free consultation. They can explain the insurance claims process in Illinois. They can also help you determine the value of the case. Passengers involved in collisions have the right to seek compensation for their injuries. A lawsuit can be filed even when the driver of their car is found at fault. In most accidents where the collision was caused by the driver of the vehicle they were a passenger in, the injured passengers know the driver personally. Therefore, there is often hesitation or reluctance to pursue a lawsuit against a friend or family member. In most personal injury cases are cases where they driver had liability insurance. In fact, Illinois law requires drivers to carry a minimum amount of liability insurance. The driver had insurance, so there is no reason not to collect it if you are injured and the driver was at-fault. At Nemeroff Law Offices we have had years of success achieving large settlements and verdicts in the area of personal injury and car accidents. Contact an attorney at Nemeroff Law Offices for additional information about our Chicago car accident lawyers and personal injury attorneys. We offer a free consultation with a knowledgeable car accident lawyer from our firm. Weekend and evening appointments are available. If your injuries prevent you from traveling, we can come to your home or hospital. If you or someone you love has sustained injuries or loss from a passenger car accident, contact Nemeroff Law Offices today. 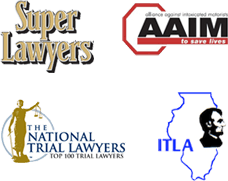 Our experienced Chicago injury attorneys are available to speak with you directly.